Here’s a workout that focuses on your upper body, on small muscles (biceps and triceps) and big muscle groups (back) alike. You can use it as a finisher to your normal routine, or do this on it’s own. Repeat it 3-4 times through as its own workout, and finish up with cardio or abs if you’d like! You can find all my other workouts here, or hover over my navigation bar to get a breakdown based on what body part you want to work. Let me know if you decide to try this out! 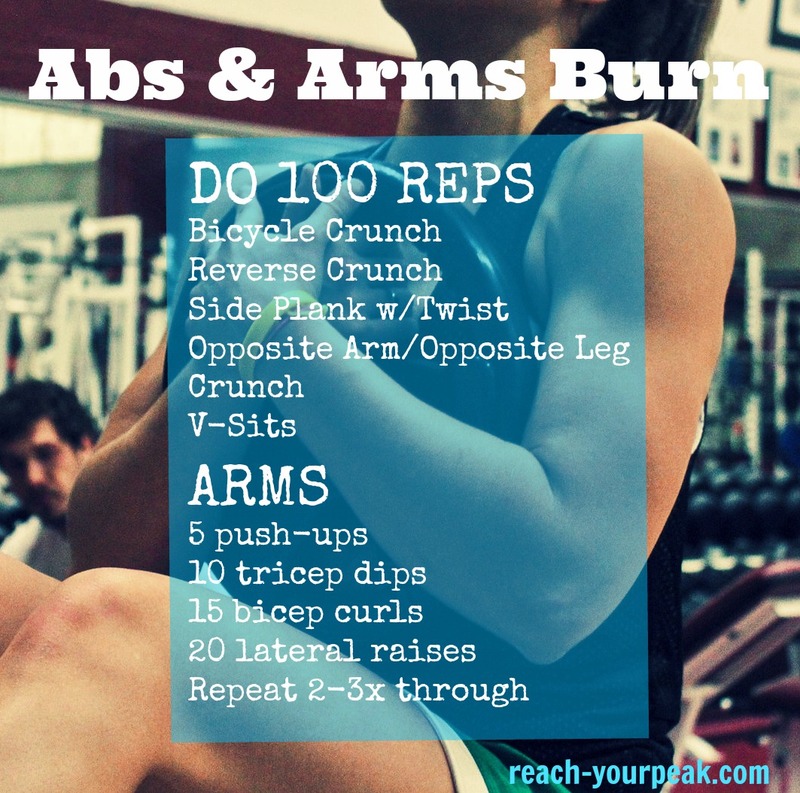 So for the abs portion, I want you to do 100 reps of those exercises. You can choose where you do 20 of each, or you can do 10 of one exercise, 5 of another, 15 of another, etc. After you’re done with abs, move straight into arms. Do those exercises 2-3 times through depending on how you feel. Let me know if you try it out & what you think of the workout! Do you like working out arms? I’m not a huge fan because I like working out bigger muscle groups, but do it because I know it will help on the bigger lifts. What arm exercises do you like? Last week I posted a quad & glute workout, so now it’s time for an arm workout! All you need is a set of dumbbells. If you only have light dumbbells, you can make it more challenging by doing more reps of each exercises. For a full body workout, you could do the glute workout, followed by this arms workout. Let me know if you try it out or have any questions! What is your favorite upper body exercise? Recently, I’d have to say bench press, even though it is so challenging for me.